A beautiful day for a walk through the fields of Provence. Here they let travelers and hikers cut across what we think of as private property, as long as you are respectful of the vineyards and orchards, which are the main crops of this fruitful valley, it’s fine with landowners. They must have been pruning the vineyards recently because I came across piles of vines like these everywhere, and while there were hundreds to choose from these two had a quality and form that spoke to me. And besides, I had to carry them for a couple of miles, so they had the right heft. I was thinking they may work in a still life somehow, but as yet I have no idea what role they’ll play or how I’ll use them. Might just be for firewood in the long run. Who knows? When I got back I placed them on the terrace floor and just looked at them. Sometimes the quiet study of what I have in front of me sends sparks through my mind, which, given room to catch fire, can send me on flights of imagery; aimless, loose, sometimes insightful, and even more often not connected to anything I’m involved in, which is the best I can hope for since it may open a door not yet known. The light was gorgeous, but on the wane, so I carried the vine around like Liberace with a candelabra, looking for a place to see it separate from the other vine, and not as a still life object. This is not something I have ever spent time doing before. My photographic stance has always been; “the world gives, I receive,” don’t touch a thing! But this year abroad, and the making of some recent still lives, has allowed me – in some cases – to play in ways I never have before. Where it’s all leading I don’t know. I’m just letting photography show me the way. 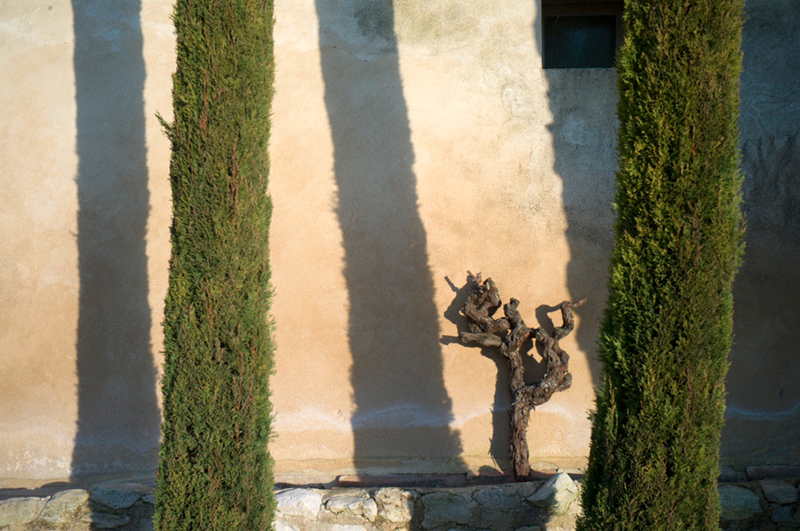 This entry was posted in Vines and tagged France, Light, Provence, Trees, Vines on February 17, 2015 by joelmeyerowitz2014. stuck here in the frigid beaches of Canada, I’m so loving your blog. My eyes weary of the frozen tundra but your daily viewings have given me some solace and inspiration to ‘get out and shoot’ the cold.